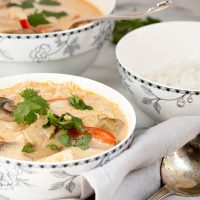 A hearty chicken and rice soup, with mushrooms and vegetables, in a lightly creamy, Thai-inspired broth. If making the soup ahead, don't add the rice until you re-warm the soup for serving, as it will begin to absorb the broth and thicken the soup. For left-overs, if you'd like to thin, you can add a bit more chicken broth and/or milk. Start rice cooking. If cooking chicken, cut in half lengthwise to make thinner pieces and cook in a skillet over medium heat until cooked through. Remove to cool slightly, then dice. Set aside. Heat large soup pot or Dutch oven over medium heat. Add 1 Tbsp. oil. When hot, add mushrooms and cook until golden and tender. Remove to a plate. In the same pot, add remaining 1 Tbsp. oil and heat. Add onion and red pepper, and saute just until softened. Return mushrooms to pot. Add broth and cooked chicken and heat through. Add fish sauce and Worcestershire sauce and simmer 5 minutes. Add cream and coconut milk, turn heat to low, then cover and simmer 2 minutes. In a small bowl, combine curry paste, Sambal Oelek, tomato paste and cornstarch and mix until incorporated. Stir into soup until combined and heat until soup simmers, thickens slightly and has a velvety appearance. Taste and season with salt and pepper, as needed. To serve, spoon some hot rice into a bowl, then spoon hot soup over-top. Serve immediately garnished with cilantro, parsley or basil leaves. Store any leftover rice and soup separately, as the rice will soak up all the soup broth if store together.